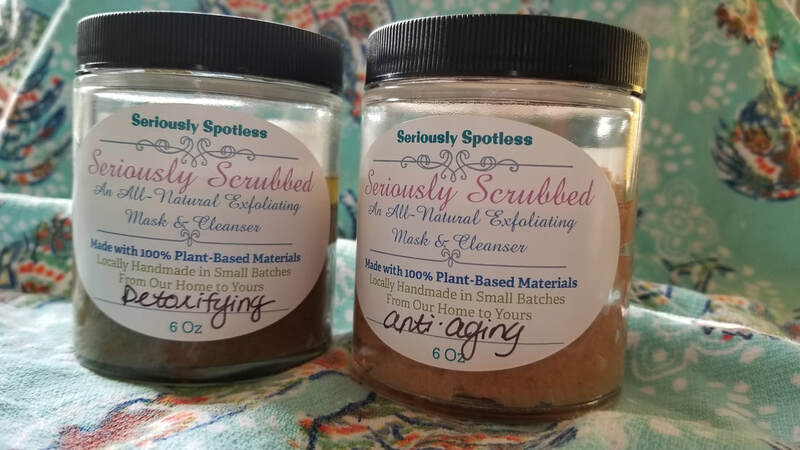 Seriously Spotless, Seriously Scrubbed is made with only the finest natural ingredients to keep your face looking and feeling fabulous! Collagen peptides aid to rejuvenate, avocado, almond, and apricot oils hydrate and replenish essential vitamins back into your skin, while ylang-ylang, geranium, and frankincense oils all work together to leave your complexion looking and feeling ageless. Seriously Spotless, Seriously Scrubbed is made with only the finest natural ingredients to keep your face looking and feeling fabulous! Bentonite clay will detoxify and draw out impurities, avocado, almond, and apricot oils work their magic to replenish essential vitamins back into your skin, while lemon, peppermint, rosemary and lavender oils soothe and leave your complexion looking and feeling flawless. ​Directions: Spread over face, avoiding eye area. Let sit for a minimum of five minutes. Gently rub mask into skin when ready to take off in order to remove dead skin cells and impurities. Rinse with warm water and pat dry. Wipe skin with towel to remove excess oil from face. No need to moisturize after. Artificial ingredients, preservatives, and animal testing is/are not used in/on our products.